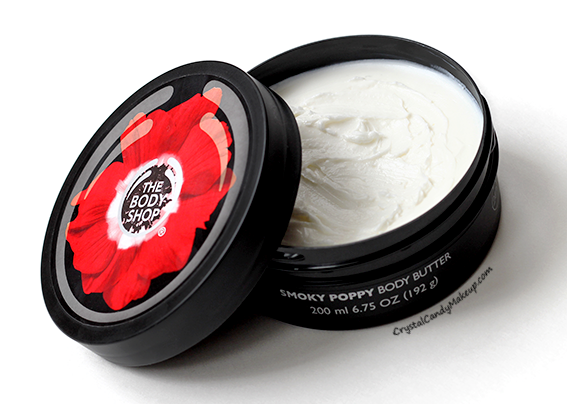 Available just in time for Valentine's Day, the new The Body Shop's Smoky Poppy collection includes 7 bath & body products : a body scrub, an eau de toilette, a shower gel, a body lotion, a body butter, a massage oil and bath bombs. I only have 2 products from this collection, but here's my thoughts on them! I think this is the kind of scent you either love or hate. I can't say it's a feminine scent yet it's not very manly either, but I love it! It's a relaxing and sensual fragrance, I can smell some lavender, ylang ylang and clove in it. It's the perfect bath and body range to use with your significant other!! I've already talked about The Body Shop's body butters a few times, they are awesome for super dry skin because they are highly moisturizing, but I personally prefer their body lotions because they sink into the skin much faster! 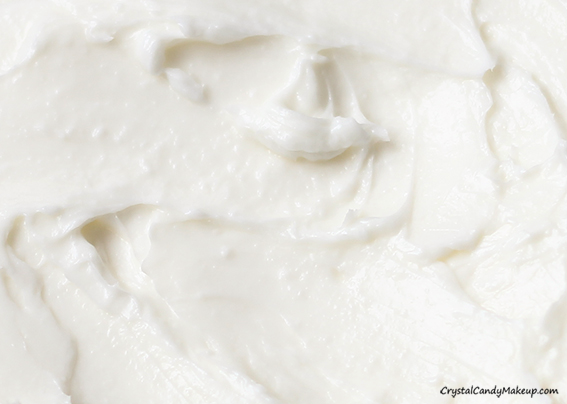 It's not the most greasy The Body Shop's body butter though, it has a similar consistency than the Wild Argan Oil butter. Ingredients : Aqua/Water/Eau, Theobroma Cacao Seed Butter/Theobroma Cacao (Cocoa) Seed Butter, Butyrospermum Parkii Butter/Butyrospermum Parkii (Shea) Butter, Glycerin, Cetearyl Alcohol, Glyceryl Stearate, PEG-100 Stearate, Ethylhexyl Palmitate, C12-15 Alkyl Benzoate, Bertholletia Excelsa Seed Oil, Cera Alba/Beeswax, Dimethicone, Glycine Soja Oil/Glycine Soja (Soybean) Oil, Parfum/Fragrance, Caprylyl Glycol, Phenoxyethanol, Helianthus Annuus Seed Oil/Helianthus Annuus (Sunflower) Seed Oil, Xanthan Gum, Benzyl Salicylate, Tocopherol, Disodium EDTA, Limonene, Linalool, Sodium Hydroxide, Eugenol, Papaver rhoeas flower extract, Coumarin, Geraniol, Citronellol, Isoeugenol, Hexyl Cinnamal, Benzyl Benzoate, Alpha-Isomethyl Ionone, Cinnamyl Alcohol, Citral, Citric Acid. This massage oil has the perfect consistency, it offers enough slip for a good massage and doesn't sink into the skin too fast, yet it doesn't feel too greasy either. If you are familiar with The Body Shop's Beautifying Oils, this massage oil is quite different. It's thicker and more emollient, while the Beautifying Oils sink into the skin much faster so you can really use them as a massage oil. 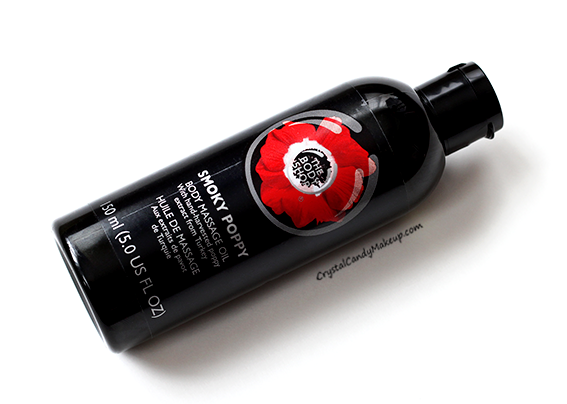 I love to moisturize my skin with the Smoky Poppy oil too, my skin is so soft and supple! Oh and the packaging is nice, I usually prefer a spray or pump when it comes to oils, but this one is actually good because the oil doesn't leak all over the bottle when I pour it in my hands. Ingredients : Glycine Soja Oil/Glycine Soja (Soybean) Oil, Zea Mays Germ Oil/Zea Mays (Corn) Oil, Helianthus Annuus Hybrid Oil, Prunus Amygdalus Dulcis Oil/Prunus Amygdalus Dulcis (Sweet Almond) Oil, Helianthus Annuus Seed Oil/Helianthus Annuus (Sunflower) Seed Oil, Olea Europaea Fruit Oil/Olea Europaea (Olive) Fruit Oil, Parfum/Fragrance, Triticum Vulgare Germ Oil/Triticum Vulgare (Wheat) Germ Oil, Sclerocarya Birrea Seed Oil, Benzyl Salicylate, Limonene, Linalool, Tocopherol, Eugenol, Coumarin, Papaver Rhoeas Flower Extract, Geraniol, Citronellol, Isoeugenol, Hexyl Cinnamal, Benzyl Benzoate, Alpha-Isomethyl Ionone, Cinnamyl Alcohol, Citral, Citric Acid.